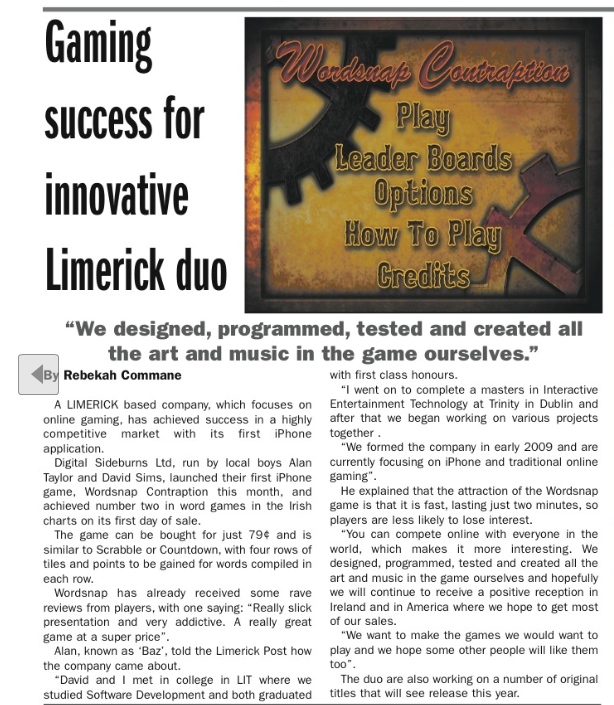 Thanks Limerick Post for writing a piece up on us here at Digital Sideburns and about Wordsnap Contraption. It’s published in this week’s edition. Wordsnap Contraption is on sale! Hey guys! Wordsnap Contraption went on sale today. You can download it here. We got to number two in Word games in the Irish charts this morning and we’re hoping for similar success in other countries. Thanks to everyone who had purchased a copy and for all your continuing support. We hope to see you on the leaderboards. Thanks a million to InfoTurtle.ie for taking some time this week to ask Dave a few questions about ourselves, the company and our upcoming game, Wordsnap Contraption. Check back tomorrow for a few words from Dave and myself as we launch our new game! I’m going to upload some more videos during the week hopefully. Still getting to grasps with the video capturing and editing. Hey ladies and gents! Hopefully some of you are visiting the site after joining our new Facebook page. Thanks for the support! Our current position is that we’ve finished our first game, Wordsnap Contraption, and it’s sent off to Apple and we’re awaiting approval. So fingers and toes all crossed that it goes well and you’ll be able to play the game in a few weeks. So what’s the game about? Think of a cross between Scrabble and Countdown. 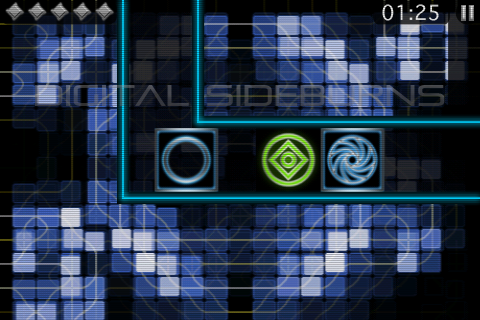 Tiles appear in the center row and you can touch and slide a tile to any of the 4 other rows. 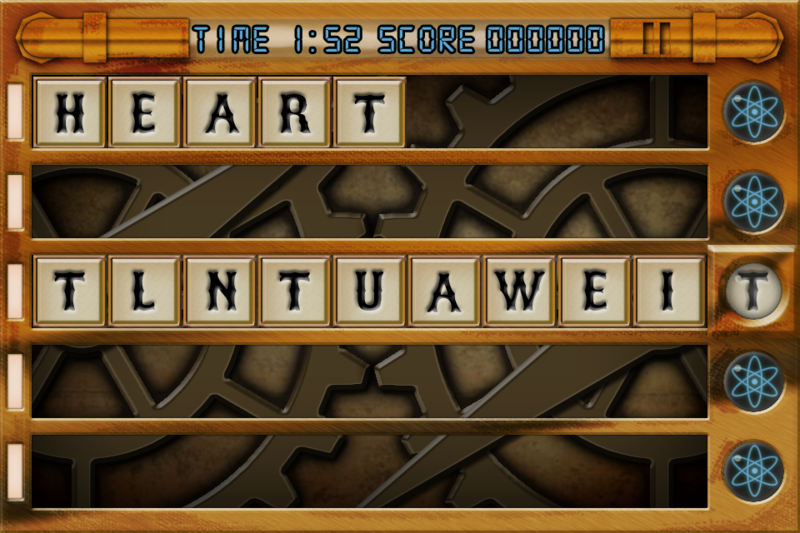 The idea is to make words on these rows, hit the button on the right when you’ve got a full word and rake in the points! 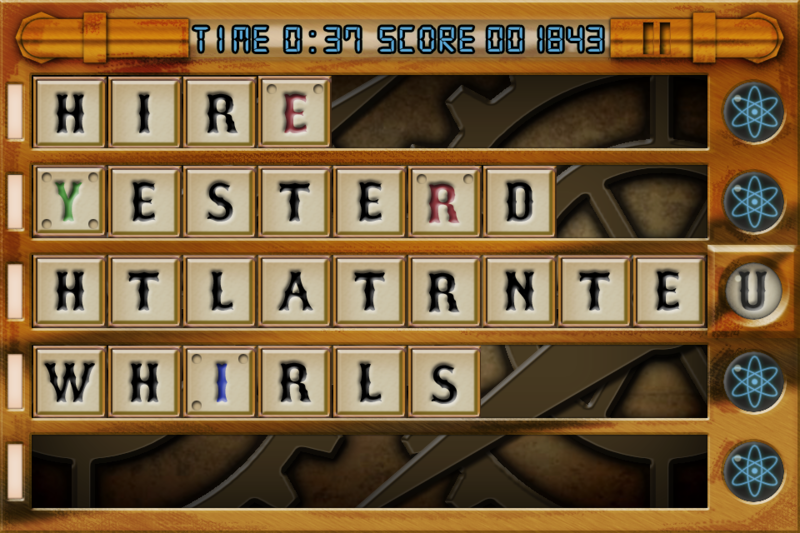 Getting words of certain lengths rewards you with multipliers that you can use in future words for big big scores! There’s also a lot of strategy to the game. 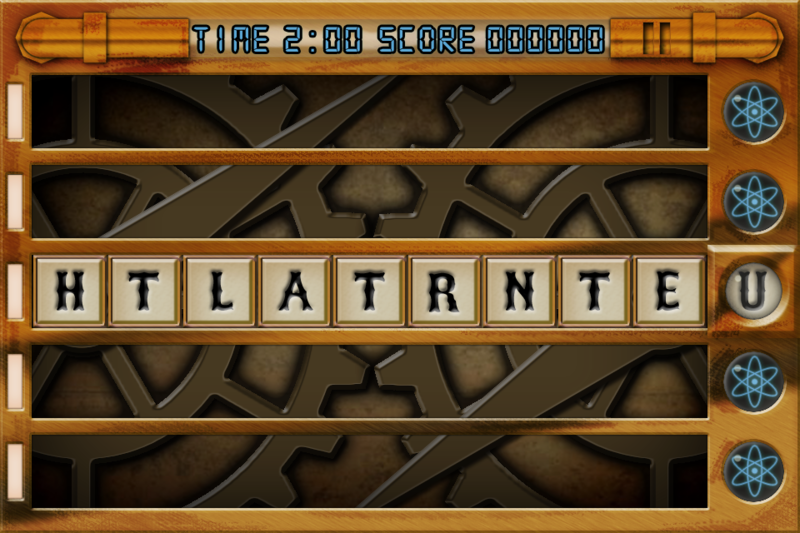 You can create partial words and hope the missing tile(s) will appear later or you can steal tiles from one row and add it to another. 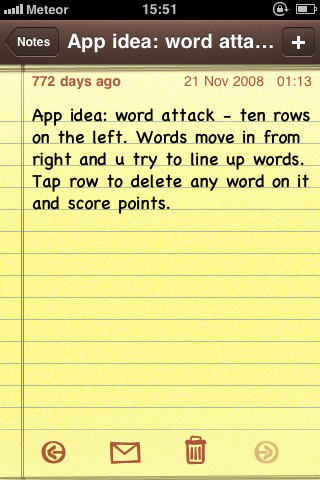 The original idea came about back in 2008 (see pic below) and we eventually got around to developing it this summer and put the polishing touches on it a few weeks back. We’re really proud of the game. Between the two of us we did all the design, coding, art and music. I don’t think the game would be anywhere as good as it is without Dave and I consulting each other and motivating each other every single day. I’m going to do a further post soon on the different looks of the game. Check back on our Facebook page soon for a chance to win a free copy of the game when it’s released! 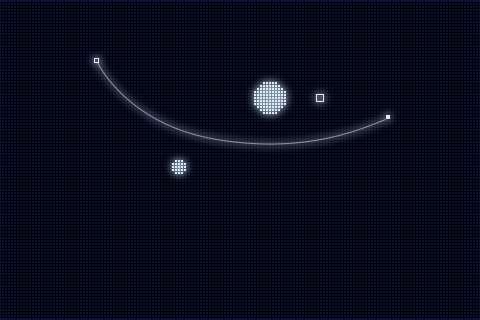 It’s been roughly a month since we started working on our gravity game, tentatively titled ‘Gravitate’. Dave wrote the flash proof of concept in around two and a half hours and it took around 12 hours, spread out over a few days, to get the game up and running with the visual style that we showed in the last post. Here’s a video of the game as of two weeks ago. The video shows an exaggerated guide for firing projectiles because we think it looks awesome. At the moment the levels are generated randomly, to be honest we’re surprised how much fun some of the levels have turned out to be. Since that video was taken we’ve started work on a more fully featured level editor, we’re not sure if this will show up in the initial release of the game or not as we’ve tied it to a local server for convenience of loading, saving and sharing levels without the need to rebuild. At the moment we’re ready to start beta testing core gameplay, but we’re going to hold off until we’ve some new gameplay features added along with our music. We’ve commissioned some retro chip tune music to be written for the game, when we get the final masters we’ll put some previews up. That’s all for now, stay tuned for more updates later in the week. Work is underway on our new project. The motivation is fantastic. The two of us have really got back into the joy of game creation once again. The new year is being good to us for sure. The idea for this project is to keep things simple simple simple! 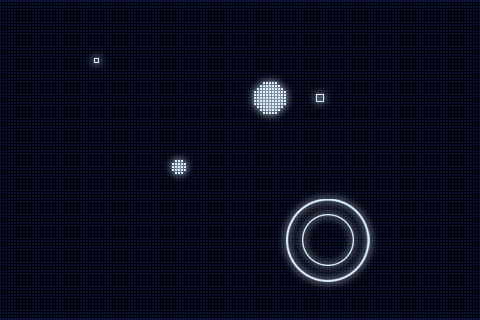 No overloading the game with too many additions to the base game and keeping the graphics very minimalist but still have a little bit of pretty. Screen Shot 1: Updated version of the concept art. 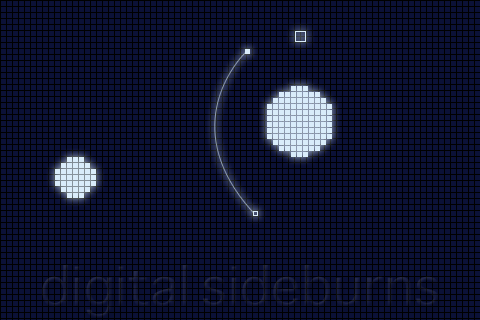 Pixels are much smaller and allows us to create larger levels. We are looking at having 6 planets in later levels. The smaller pixels also lead to other ideas we might explore. 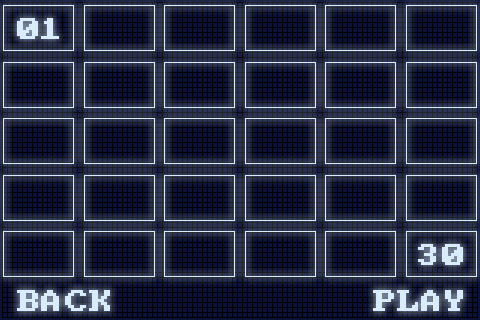 Screen Shot 2: Sample level select screen. Need to find a nice free pixel font. Add some indication of which levels are cleared and actually write all those numbers between 1 and 30! Screen Shot 3 & 4: Concept idea for our control input. 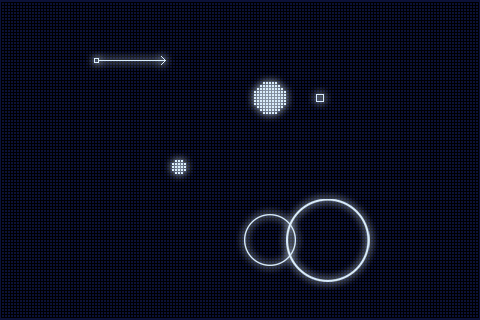 Two circles appear when the thumb touches the screen and the player can drag the smaller one to change the direction and speed of the shot. This will cause the direction arrow on the start area to change direction and length also. This fixes the problem we had with controls on the flash version not being useful in all situations on the iPhone. Mainly if the start area is close to the edges of the screen and you can’t get enough pull back on the shot. We’re writing a short design doc now to lock down everything and avoid feature creep later on. Expect another blog post after it’s done discussing our scoring system and maybe a look at a second simple game mode. Obey gravity, it’s the law! There’s no arguing with that, and we here at Digital Sideburns would not like to run afoul of Newton, Kepler and Einstein, even though they’re all dead… in that case we would not like to run afoul of Zombie Newton, Zombie Kepler and Zombie Einstein! In an effort to appease the gods of science, we are taking a break from working on “Fray” and we are going to produce a game in a similar vein to “Gravity Wars”. Ladies and Gentlemen, may I introduce you to our latest iPhone project: Codename Shoot the Blue Guy! We were messing around with Adobe Flex the other day and we created this little demo: Gravity Game. We ended up playing that a lot more than we should have, approximately a million times longer than it took to program. Ok, that’s a lie… that would amount to 285.19 years of play-time, but it’s close. We’ve been keeping our cards close to our chest lately with regards to the development of “Fray”, but we’re going to develop this game in the open. Over the next few weeks expect a barrage of updates and a call for beta-testers very soon. The game will be released for the iPhone, pending Apple’s approval in both full and lite versions. We’ll post more propaganda right here, stay tuned! First off; apologies for laying low. We haven’t been posting much lately because we’ve been working quietly on a number of projects which shall be revealed shortly. We hope you like our site’s new look. Progress on ‘Fray’ (the game formerly known as Project Slideblox) is coming along nicely. We decided to use the game as an opportunity to implement some key technologies which should speed up the development of future games significantly. One of the new features that we have added to our game engine is scripted animation. Our new Animation Engine, written using C++ and OpenGL, handles all scripted animation within the game. This includes our intro animations, logo, main menus, level backgrounds, the pause menu and more. The Animation Engine works in a manner similar to Adobe Flash, you specify the position, rotation, color and state of an object at specific keyframes and the engine interpolates between them. It can handle plain images, images loaded from a texture atlas and buttons, which are a collection of images representing the various button states. Expect some demonstration and discussion of the animation engine to come soon. In other news, we are planning a new web venture which we are keeping under wraps for now. If our market research says it’s viable, we’ll run with it and you’ll find out about it right here. One more thing, Dave decided to play around with the Adobe Flex SDK yesterday in order to evaluate it’s potential as a tool for rapid prototyping, the result? He made this little game, check it out: Gravity Game. The last update was a long time ago. Since then we presented our game at the Game Developers 6th Birthday Shindig in Dublin. We got an extremely good response from everyone there, lots of advice and a very helping hand in order to get us one step closer to releasing our game. So thanks to John, Aphra and Matt. Development time since then has been longer than expected but I think we’ve benefited so much from it. Graphics have improved a lot, probably one thing we heard most in Dublin was to improve them. The game engine is now extremely efficient. We’ve created a really versatile and powerful animation engine that is now probably doing a good portion of the work in the game including menus, cut scenes, in game effects etc., in less than half the time of normal methods. Here’s a demo version of our game intro, script changes to come soon! : http://www.youtube.com/watch?v=2qJseoFYLvI The video also reveals the name of our game, Fray. We’d been working under our code name for a long time waiting for the right name to come along! Currently the puzzles are looking pretty awesome. The final number on release isn’t know yet, still sorting through them all finding the best ones and ordering them in terms of difficulty. Hopefully we’ll have a few videos up soon of some game play. The game is finally coming to an end and we hope to release soon and move on to some new (smaller!) projects in the new year.